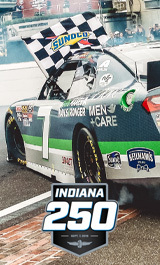 The Indianapolis Motor Speedway regrets to announce that persistent rain has forced the postponement of all NASCAR track activity Sunday, Sept. 9 at the Indianapolis Motor Speedway. All tickets for both races will be honored at the gate Monday, and tickets remain on sale at IMS.com, the IMS Box Office and at the gate. Fans with reserved seats for the Xfinity Series race are asked to move to an open seat nearby if another fan holds that same reserved seat for the Cup Series race. Gates open at 9 a.m. The Big Machine Vodka 400 at the Brickyard Powered by Florida Georgia Line (Monster Energy NASCAR Cup Series) was originally scheduled for Sunday, while the Lilly Diabetes 250 originally was scheduled for Saturday. Practice and qualifying for both races was rained out. This is the first time the Big Machine Vodka 400 at the Brickyard Powered by Florida Georgia Line has been delayed a day by rain in the race’s 25-year history.